One great way to save money is to stop buying and start making a few household and cooking essentials. 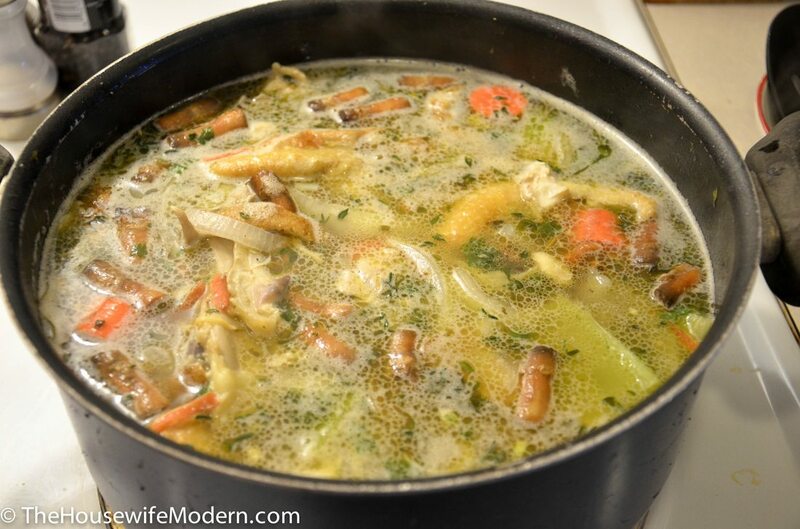 Did you know you can make vegetable and chicken broth out of what you were going to throw in the trash? Yes, you read that right. You know those pieces of meat and bone you throw in the trash? And the vegetable scraps you throw in the trash? With that and a couple of herbs, you can make vegetable and chicken broth. In my opinion, that’s like getting it for free. Keep two freezer bags in the freezer. One for chicken (or turkey, any poultry really) scraps and bones. The other is for vegetable ends or unused vegetables. I go through our vegetable drawer on a regular basis. Even though we do our best to eat all the produce, occasionally there is some that just doesn’t get eaten. Now it doesn’t go to waste. I wash it, coarsely chop it, and throw it in the freezer vegetable bag. A little extra tip: If you really, really want to stretch a dollar, here is what we do in my house. I buy a whole chicken (on sale, of course). Buying a whole chicken is the cheapest per pound anyway (versus buying legs, etc.) 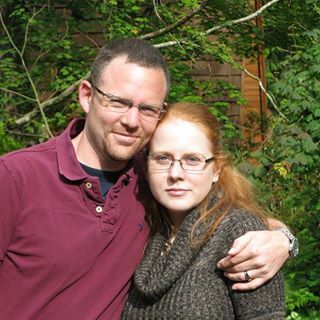 I roast it and the first two days, husband eats the legs and thighs, his favorite part. Then I chop off most of the rest of the meat and make chicken pot pie. (Click for my chicken pot pie recipe). But wait…we’re still not done. 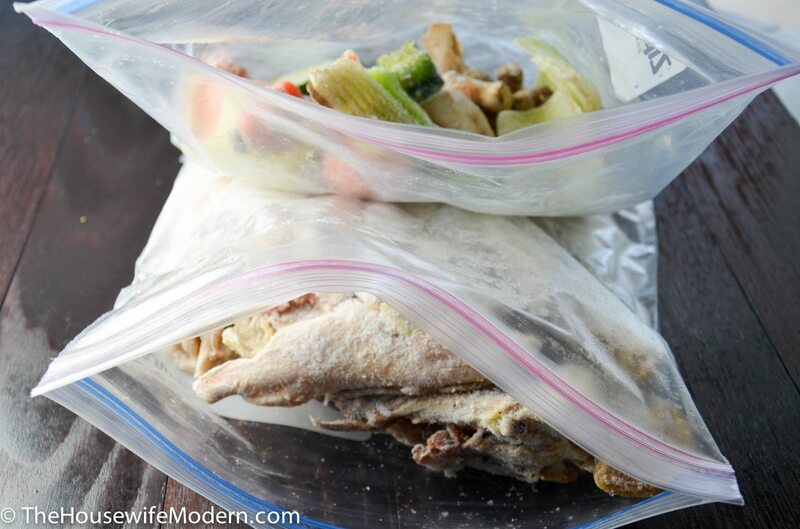 I throw the scraps, including all the bone (yep, the whole chicken) in a Ziploc in the freezer. And, of course, use them to make chicken stock. Frozen chunks of vegetables & scrap meat (including bones). I took step-by-step pictures so you could get an idea of the various steps: how big you can leave the vegetable chunks (nope, you don’t need to dice!) and how I strain the broth, etc. I use scraps from the freezer. For the herbs, when I have extras, I freeze them in olive oil so I actually don’t have to buy those either. Like I said, this is practically free. Toss a thyme cube and parsley cube in a large pot. 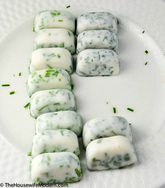 (For how I make thyme/parsley cubes, see “12 Ways Ice Cube Trays Can Save Time & Money.”) Add frozen vegetables, sauté for about 5 min., until they start cooking/browning. Add rest of ingredients (chicken scraps, bay leaf, water, salt, & pepper). Simmer 4 to 5 hours. Strain. Cool. Skim off fat. And yes, that layer of fat looks horrible. I know. But trust me, the final product tastes good! A good portion of the fat layers on top when you allow it to cool. 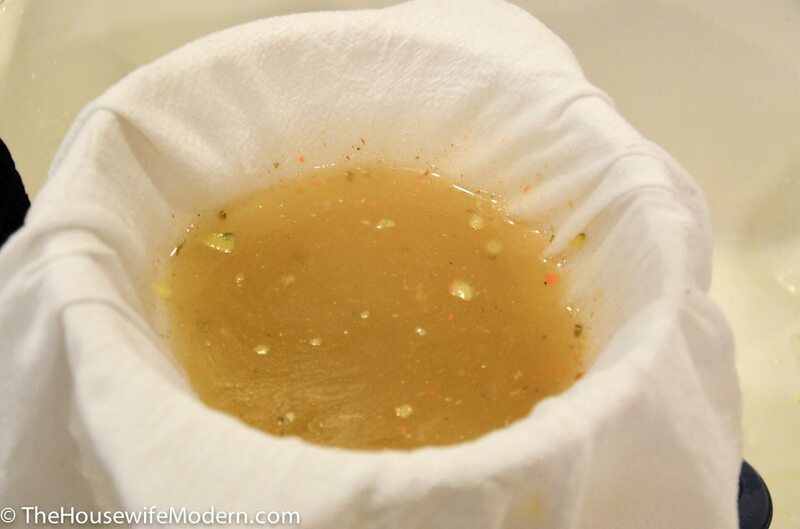 Use a flour-sack dishcloth, put it in the same strainer used above, and pour the skimmed broth into a pitcher. 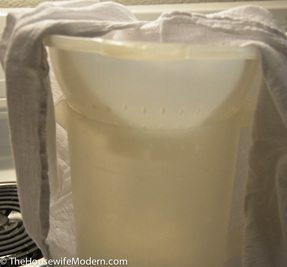 After a little bit, you may have to “wiggle” the cloth a little bit to get it to finish straining. 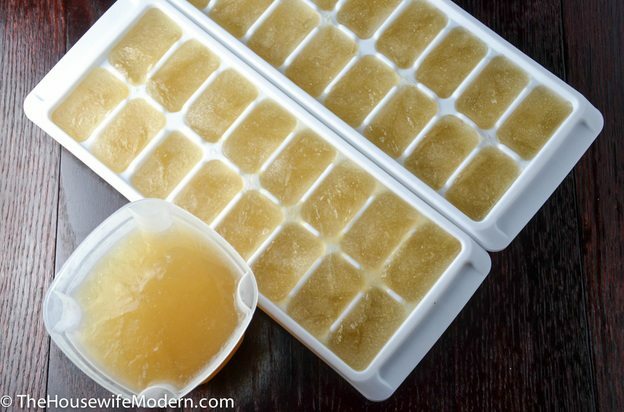 I freeze some of it in a larger container- for when a recipe calls for 2 cups- and the rest as “ice” (broth) cubes. Each cube is approx. 1 Tbsp., so it’s easy to thaw out exactly how much I need. Heat olive oil & herb cubes in a large pot over medium-high heat. Add vegetables and cook until vegetables start to brown, approx. 5 minutes. Add the chicken carcass and scraps. Add enough water to almost fill the pot. Add the bay leaf, salt, and pepper. Bring to a boil. 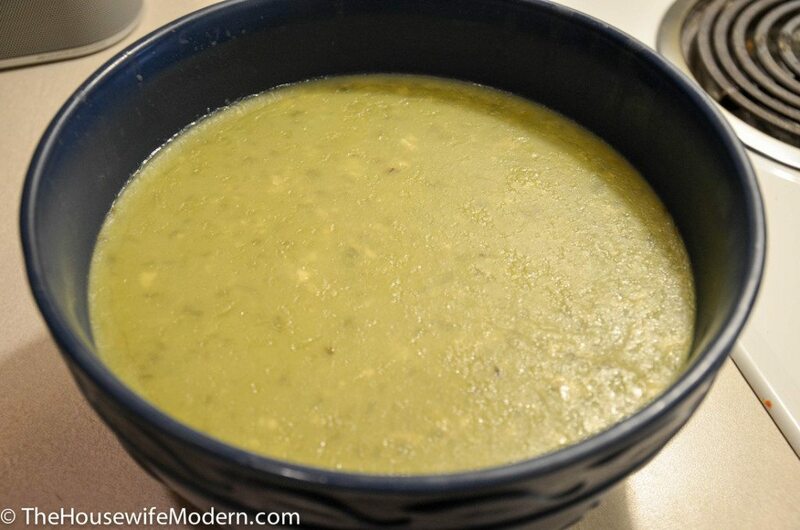 Reduce heat to a very low heat and simmer 4 to 5 hours. Let cool slightly. Strain into a large bowl to remove the solids. Cover and chill in the refrigerator. A layer of fat will form on the surface. Skim off and discard. Use a flour-sack dishcloth and strain again. *If using olive oil and fresh herbs, add fresh herbs during step 2 with bay leaf; do not sauté with vegetables. 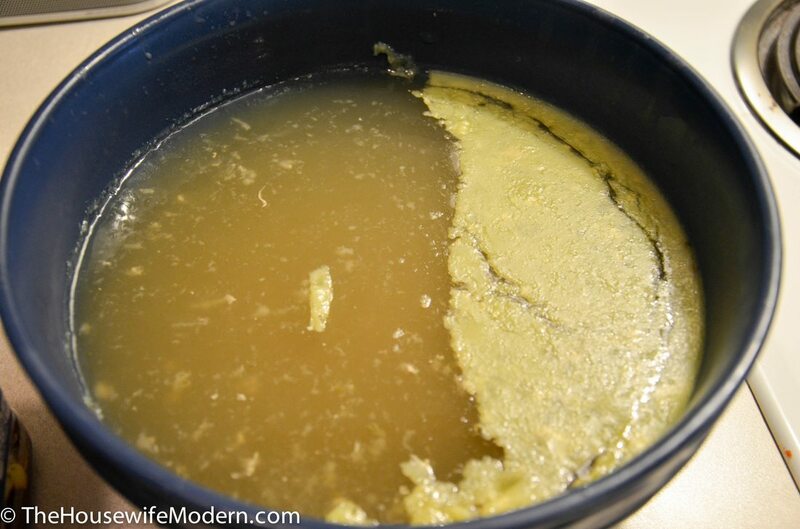 ***For vegetable broth, use 6 C. vegetables & no chicken. Follow rest of instructions as normal. Peels of veggies that don’t need to be peeled, but often are for texture or looks: carrots, zucchini, asparagus, etc. ~Feel free to try out other ones. Each combination will give your broth a subtle difference.